Jump and Bounce your way through over 50 levels while you avoid lava, spikes and pitfalls. Thanks for letting me know. I think I fixed the problem. I will try to download it myself and see if it works. Let me know if you can too please. Thanks. Bleeding Tapes Game Jam #1 community · Created a new topic What is your favorite Tower Defense Game? So what is your favorite tower defense game and will you try to take some of its elements and incorporate into your game for the jam? Mine is Defense Grid and I will try to use its extensive mazing and upgrade features. Bleeding Tapes Game Jam #1 community · Posted in What is H.I.E.M.S. I believe HIEMS is a game being developed by Bleeding Tapes, the organizer of this jam. Its like a retro style side scrolling shooter. Nice graphics. Gameplay was very hard though. Hit detection felt a bit too strict and movement felt a bit off. Worms is one of the all time classic multiplayer games and you've managed to capture that same great fell. Great job. The spells are fun, the levels are interesting to navigate and destroy. Aiming could get a bit wonky at times as the aimer wouldn't respond, but overall its very fun. Pretty solid shooter/platformer. The visuals were very polished and the 3 levels were very different from one another. The boss fights really shine. I can tell lots of time went into them. I felt like some jumps, especially in the ghost level were a bit cheap, but nothing overly frustrating. I love Megaman games, so this is right up my alley. Great job GhostlyFeline. Not bad. The harsh sounds and screen shake can get annoying. But overall I played for a while since it just felt good to shoot and dodge your own saws. The upgrade system is a nice touch too. Good game. Its a solid top down engine, just missing some more gameplay features to make it fun. The rooms don't really seem connected either. A more obvious way to scale game window up would be nice. You can make it bigger with Alt+Enter, but then you cannot control the character. The platforming engine is solid, but the game has lots of "gotcha" deaths which get annoying fast. Still, I can tell a lot of work went into building this world, whihc is good. Why is this game 48MB? Much bigger than any other game. Its a nice concept but its ruined by some annoyances. Why do I have to hold down for several seconds to change spells? Why does it take so long to recharge my spells. Why do all spells share the same recharge time? So you can just place as many towers as you like with no limit? Made the game fairly boring. Shame, since you have a good foundation for a TD game. OMG. One of the best games in this jam! The puzzles were fun. Not too hard. The music so nice. I love that victory jingle. Clean graphics So many levels! Love it. Unable to play game, the window is too small. You should consider adding a scale window feature so you can make it 2x, 3x, 4x bigger so you can actually see the game. Gameplay could use a little more features. But its a solid base for a top down shooter. I love all the different weapons you can get. Solid platforming and lots of game to explore. Love it. Not a bad bullet hell shooter. I like the drone behavior and the clean graphics. Incredibly short game. The coin pickup sound is very harsh. But its a good platform engine. A little more feedback as to what you should do would be nice. The info option doesn't seem to do anything. Controls are a bit unresponsive. Couldnt get passed first enemy. The gameplay is surprisingly fun. Very hard with keyboard, but on controller, once I got used to which buttons do what color, it got pretty fun! Even on easy it gets hectic fast (in a good way). The only big complaint is the very short music loop. The music loops so often that I had to mute it. Still, fun game. I like the old school Gameboy color scheme. I think the gameplay is a bit too simplistic and the screenshake is a bit too much. Still, a solid shooter foundation. Would be nice to have controls explained. @MSTOP, thanks for comment. I totally agree with the one life thing. Had I had more free time to work on this, I would have implemented that (not that it would be that hard to do). As for that block counter glitch. Totally just looked at the code and yeah, its obvious now that going under zero tiles can cause this. Fixed it now. So we CAN update our games with small tweaks? Sweet! I'm gonna get back to work then. Thanks for the feedback. I have since uploaded a new version fixing that bug among other tweaks. I actually am not using shaders for the color effect. I'm simply overlaying a colored transparent rectangle over entire view. Its crude, but gets the job done. I made the game using Gamemaker Studio. Well the ability to swap move speed with items is the most enjoyable and a concept that you can really build on. The least enjoyable was the slow movement speed of the player. I understand its part of the mechanic. But maybe instead of transferring the speed to the player, it transfers to the gun or something else, that way the player can still move at a normal speed. I would appreciate some feedback on my GBJAM game. Thanks! Nice concept. Never played anything like this. 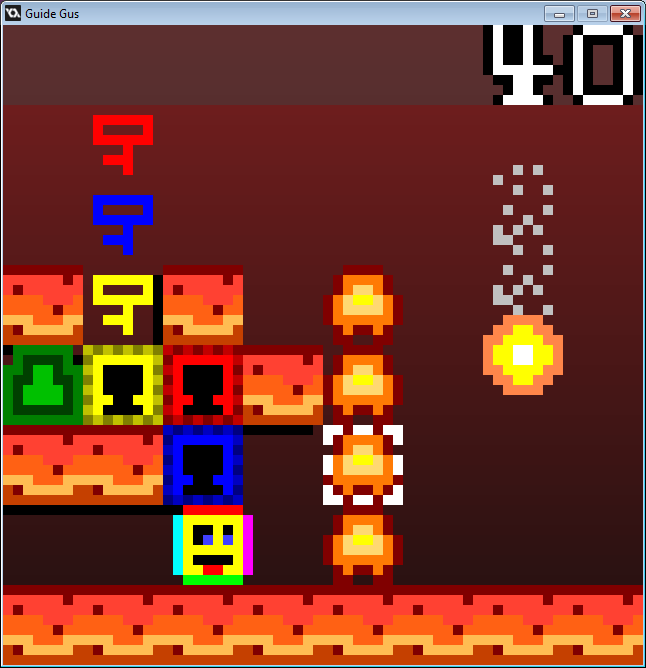 A shot of my lava tileset from my game.